Martin Harvey of the Centre for Ecology & Hydrology explains the importance of iRecord, the online biological recording system, which hit the landmark of one million observations from the public during 2018. Go out for a walk in a park, nature reserve, farm field or urban street and there’s bound to be something living nearby, whether it’s a plant, insect, bird or other organism. We generally enjoy such encounters with wildlife, but how many of us take the time to identify and record what we see? Thankfully the answer to that question seems to be: a lot of people! The latest testament to this is that more than a million records of wildlife were added to the iRecord system in 2018, the largest annual total since the website was established in 2013. The number of observations for 2018 will continue to rise over the coming months as the public adds sightings made last year. Each one of those records represents a meeting between humans and wild species, and also an interaction between humans and technology so that the observation is recorded via one of the many apps and websites that link to the iRecord system. The million-plus records cover more than 15,000 different species of plants, beetles, flies, moths, fungi, bees and many more. An individual wildlife record may be of interest in its own right, but when lots of records from many people and places are brought together a much richer picture starts to build up. For more than 50 years, the Centre for Ecology & Hydrology’s Biological Records Centre (BRC) has been working with a wide range of wildlife recorders and recording schemes, both voluntary and professional, to bring together wildlife data and then to analyse and interpret it. The records include many submitted by members of the public as and when they see wildlife, as well as via more structured surveys such as the UK Butterfly Monitoring Scheme, the National Plant Monitoring Scheme and the UK Pollinator Monitoring Scheme. A wide variety of apps, each dedicated to a certain species group such as ladybirds or butterflies use the iRecord system, and make reporting sightings a simple process. The apps, which are free to download, guide the user through the identification of species. Members of the public report the species observed and location, add other information and submit a photograph, which helps the verification process. Bringing wildlife data together has led to great insights into changes in our environment and the species that share it with us. The Centre for Ecology & Hydrology carries out a wide range of research that draws on the amazing resource contributed by wildlife recorders and recording schemes. Recent examples include the ASSIST programme which uses wildlife records as one of many strands of information to predict changes in the wider countryside under different future scenarios. Data from iRecord and the contributing recording schemes also feed in to the analysis of trends in species distribution and abundance, and to the assessment of conservation and policy priorities – for example, the records contribute to species elements of UK biodiversity indicators. Research into and conservation of wildlife relies on having accurate and dependable data, a key issue when gathering records from many different sources. The role of recording scheme verifiers, nearly all of whom are volunteers, is absolutely essential in checking that the records are accurate, and in helping people learn about wildlife and how to identify it. The iRecord system has been set up to enable records to be collated in one place and made available to the expert verifiers who carry out this vital role. The next part of the jigsaw is to ensure that the records can be shared and used for conservation and research. Once added to iRecord, records become available to the national recording schemes and to local environmental records centres (LERCs). In conjunction with the recording schemes the records are also made available for research and shared via the National Biodiversity Network (we now have automated monthly updates to the NBN for many sets of iRecord data). To find out more about the recording schemes and the many different wildlife groups that they cover, go to the BRC website. If you are new to wildlife recording follow the links to the scheme that covers the type of wildlife that you are interested in – many of the recording schemes run training courses, sometimes in partnership with the Field Studies Council or with LERCs. You can add records to iRecord via our main website www.brc.ac.uk/irecord, via one of the iRecord apps or via other websites that link in to the iRecord system. The 1.2 million observations in 2018 were of more than 15,000 species. The most recorded species was the Speckled Wood butterfly. 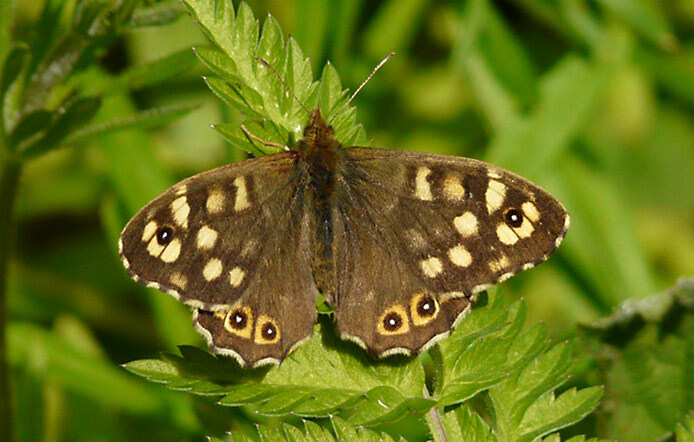 The Speckled wood butterfly was the most recorded species through iRecord in 2018.
iRecord is maintained by the Biological Records Centre, supported by the Natural Environment Research Council award number NE/R016429/1 as part of the UK-SCAPE programme delivering National Capability. The wider work of BRC is supported by the Joint Nature Conservation Committee and the Centre for Ecology & Hydrology within the Natural Environment Research Council.